UPDATED: Call for Proposals: Extended Deadline! 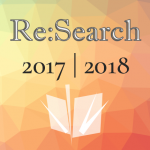 Re:Search, the Undergraduate Literary Criticism Journal at Illinois, is still seeking submissions for its Spring 2015 publication! Our Open Journal Systems portal begins accepting submissions on Wednesday, November 5th and will remain open until 5pm, Monday, November 10th. We offer an opportunity to publish your work, including papers written in other classes and honors seminars, a current thesis, or a thesis to be written next semester—both Fall and Spring thesis writers are encouraged to submit in an online academic journal, and we hope this change will accommodate the Spring thesis proposal deadline on November 10th. Please see our Call for Proposals 2014-15 EXTENDED DEADLINE for information about our journal and submission guidelines. To find out how to get involved with other aspects of the journal, we will be hosting Peer Review workshops on November 3rd and 5th, rooms and times to be announced.